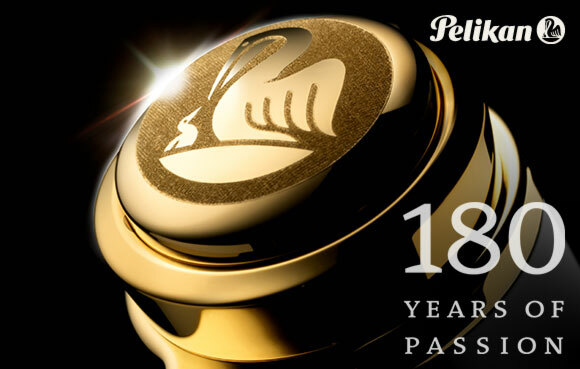 The year 2018 is a very special year for Pelikan. 180 years ago our company was founded. The Pelikan anniversary year is guided by a unique guiding idea: Passion worldwide! We owe this guiding idea not only to our founder Carl Hornemann who laid the foundation, but also to his successors Günther Wagner and Fritz Beindorff. They established our company in the international markets with a lot of courage and inventive talent. This is a big success which we pursue with a lot of responsibility. For Pelikan, passion is an attitude! And the winner 2018 is... the new Edelstein Ink color of the year Olivine. Again the Pelikan-fans have decided for their favorite color: the dark, olive-green color version is the winner selected out of 1,200 color ideas. Created and chosen by fans from all over the world, it will be the most-wanted color for all fountain pen lovers in 2018. 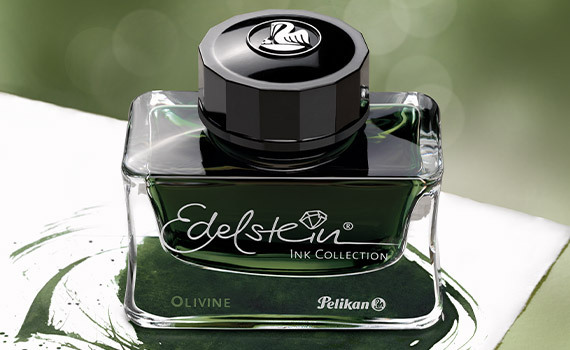 The Edelstein Ink Olivine will be available in a glass bottle. All our shades of the Edelstein Ink Collection contain a special ingredient that ensures extra smooth writing. This distinctive new fine writing instruments series will convince you. It is a very extraordinary gift idea for a special person or even for you. These colors will brighten your day! The white parts are made of high-quality resin that is first turned and then polished to a high sheen. The barrel with the white and turquoise stripes is made of cellulose acetate that was very carefully manufactured and turned into a sleeve. All rings and the typical Pelikan clip are plated with 24 carat gold. 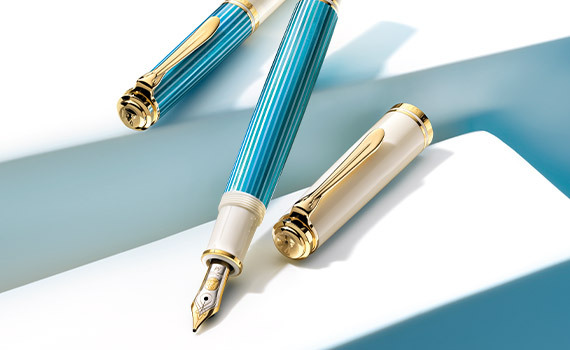 The fountain pen has a 14 carat bi-color gold nib with rhodium trim and will be available in 4 nib widths EF, F, M and B. The matching ballpoint pen has a twist-mechanism. Every single writing instrument is mounted by hand and carefully checked to fulfill the strictest quality criteria. The Souverän 600 Turquoise-White is encased in a specially designed gift box and available only for a limited time in limited quantities. The series 120 was well known in a black-green appearance, launched in 2016. Now it is back in an iconic blue shade. It shows a well balanced mixture of traditional design outline and dark blue as a perfect suiting color. The stunning light blue ink window puts a highlight. In that way the tradition is smoothly boosted by contemporary appearance. The series M120 will be available as fountain pen only. For true pen lovers and as a perfect gift, we also offer this fountain pen in a special gift box with historical design. The decoration element clip is a lovely interpretation of the typical Pelikan beak shape. The gold plated stainless steel nib has a special nib engraving, created only for this series. For different needs in writing, the nib is offered in nib sizes EF, F, M and B.